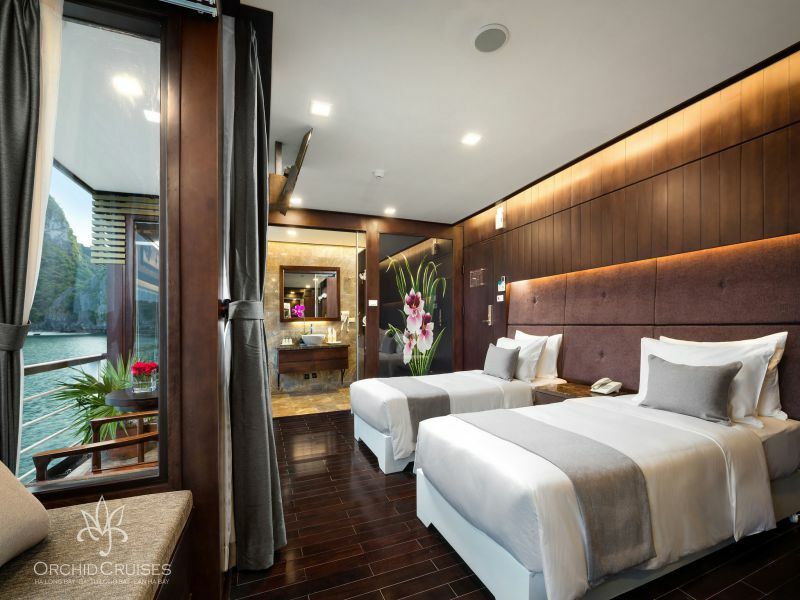 Kayaking, swimming, cooking class, Tai Chi on Sundeck. Take dinner party on the cruise included local food and seafood. 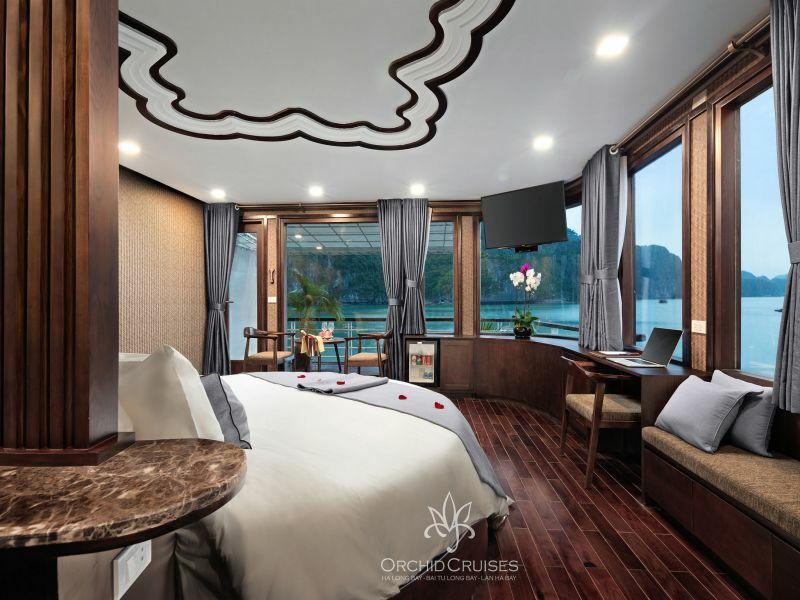 12:00 am: Transfer by tender to the Orchid Cruise, starting to explore Halong Bay – one of the New Seven Wonders of Nature. 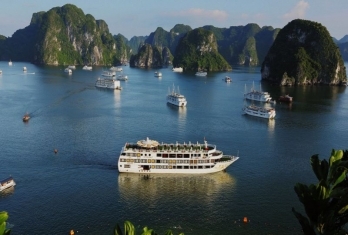 Reach to Cruise, you will check in, and have lunch on a cruise while the Orchid Cruise to Halong Bay. 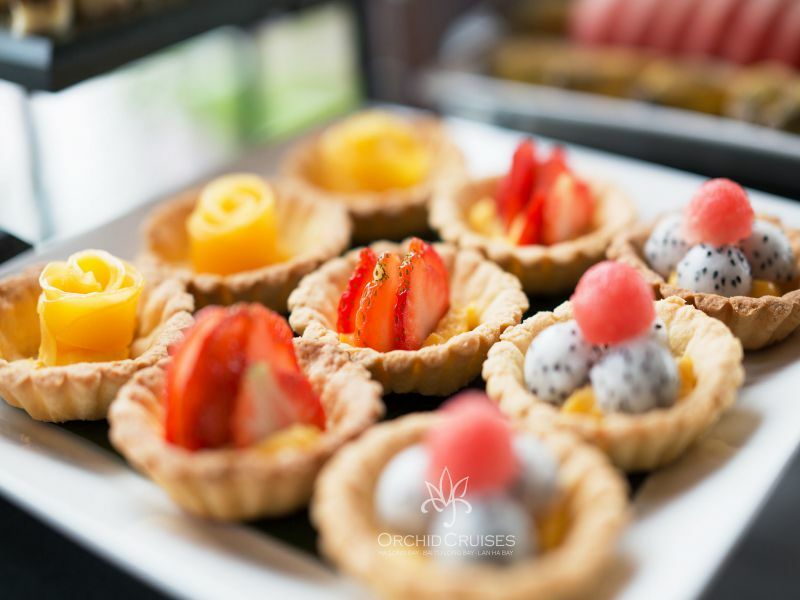 13:00 pm: Orchid Cruise proceeds to Da Chong islet, where you can see a lighthouse built by the French over 100 years ago. 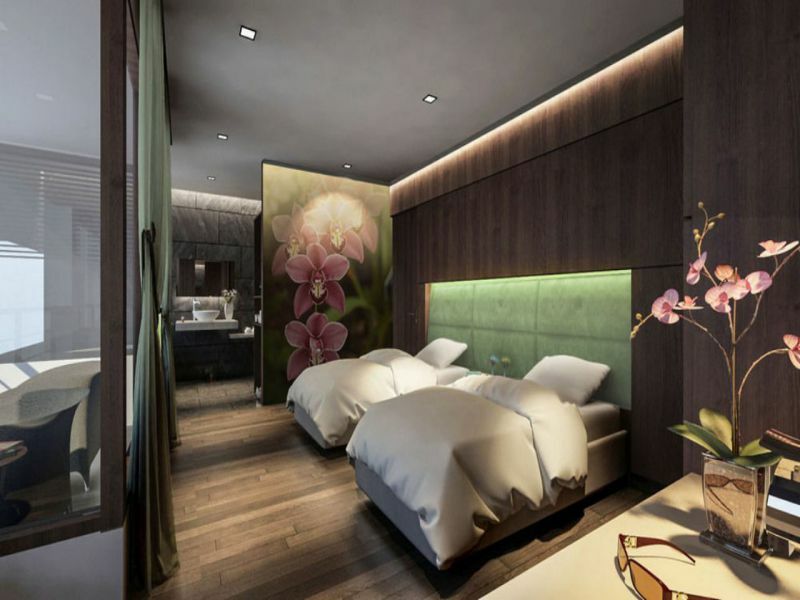 You will visit Con Vit and Gia Luan islands. These are amazing limestone karst outstanding in the sea in an impressive manner. This area is a different feature with many cruise ships. 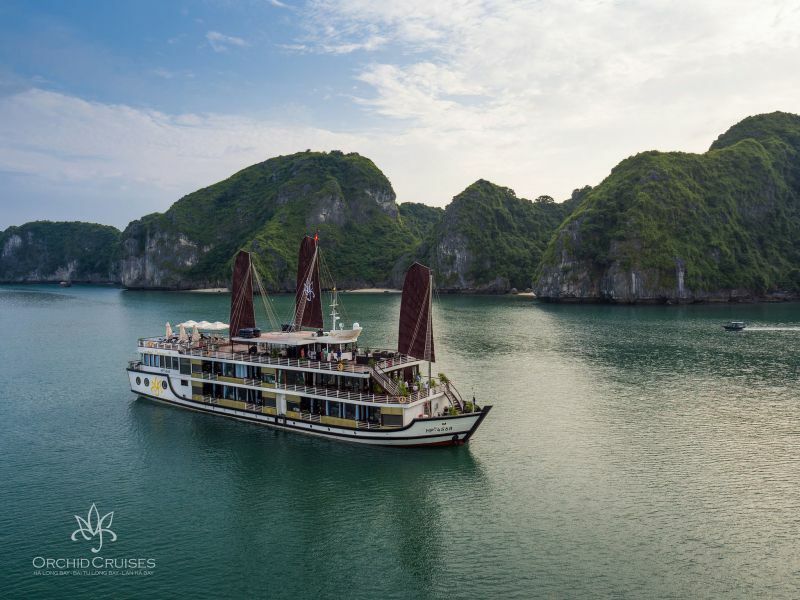 Just only Orchid Cruise uses the route via the Cat Ba Island – Thoi Quyt area – Coc Ngoi islet – through Cua Van to Ba Trai Dao area. 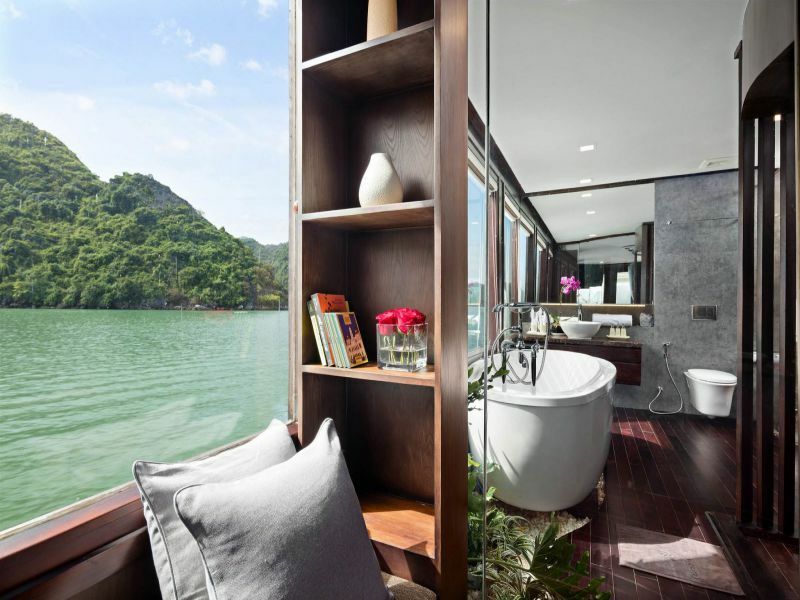 We come to Ba Trai Dao beach area of Lan Ha Bay – a separate part of Halong Bay. This is a non-touristic paradise in Vietnam. The region is known for its ancient Beaches and amazing beauty, having about 400 spectacular islands. You may prefer to enjoy kayaking and swimming. This is a great experience, immersed in the blue and clear waters of the bay, in the Ba Trai Dao area. 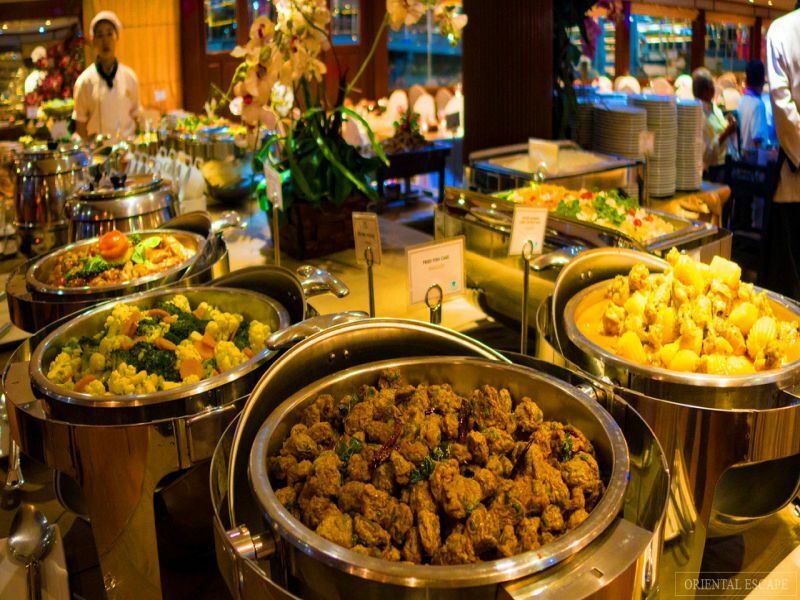 19:00 pm: Get deluxe dinner in luxury restaurant. Enjoy delicious local food prepared and served for you by our friendly onboard catering staff. 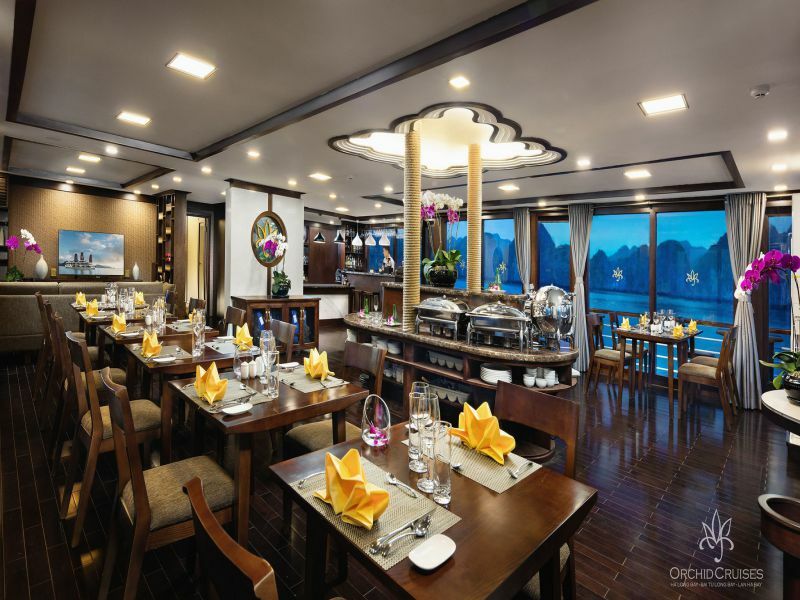 After dinner, you will enjoy the atmosphere of the bay at night up on the top deck. 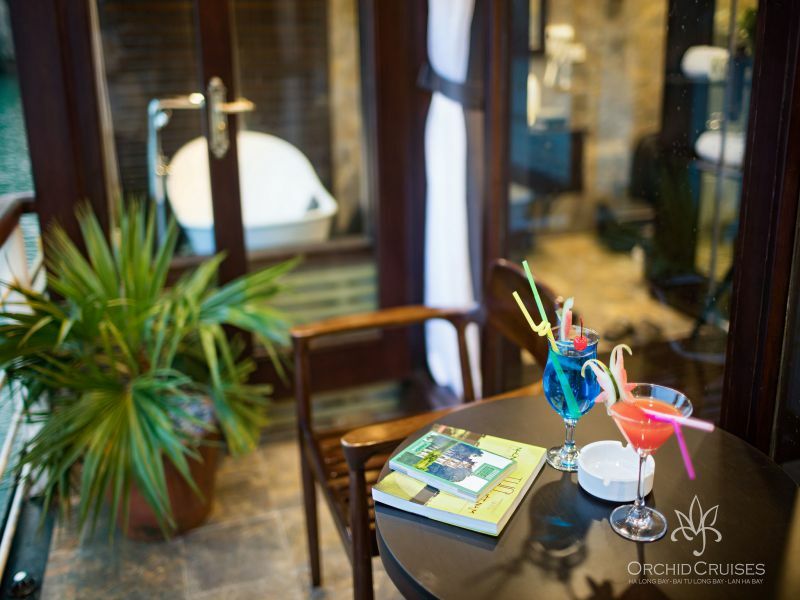 Relax whilst enjoying drinks from the bar. You can play games, attend to squid fishing, watch a movie in the restaurant. 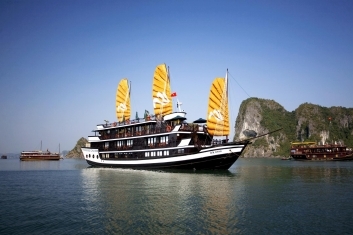 6:00 am: Get Tai Chi Lesson on the Sundeck, feeling a fresh atmosphere in Halong Bay in the early morning. After which we serve light breakfast in the restaurant. Continue our journey in canoes to explore the Sang Toi cave is situated. 10:00 am: Return to Orchid Cruise boat for check-out. 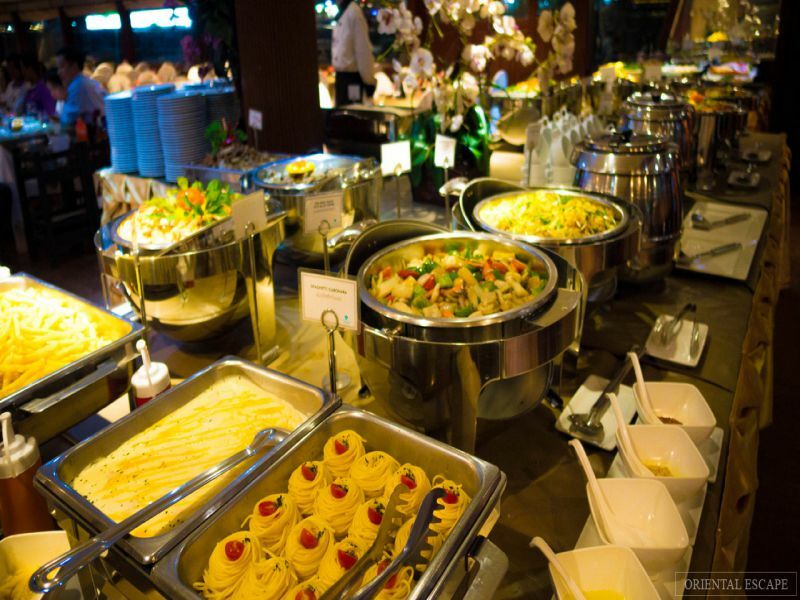 While cruising back you can enjoy a brunch in the restaurant. Happy with the cruise trip. Excellent food and room. Tour guide was very informative and helpful. I booked in the last minute with Ms. Hien. She was very nice, friendly and helpful. Thank you! My husband and I were one of the first guests of this cruise, with a whole new boat and itinerary. We got a special price for the suite. The boat was amazing, very elegant and special, extremely clean. Staff was doing their best to please us. The dinner of the first night was spectacular and tasty. 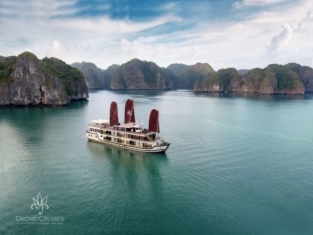 The itinerary is made in a way that you get to see most of halong bay, leaving from a smaller bay that is less busy with tourists – and the road from Hanoi is shorter and more convenient. The way from Hanoi to the bay was in a very comfortable “limousine” van. 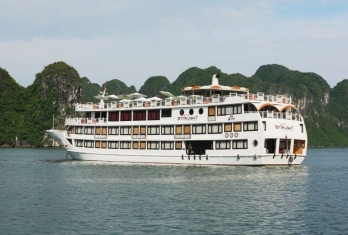 Orchid Halong Cruise is one of the most luxury cruises in Ha Long Bay and Bai Tu Long Bay. 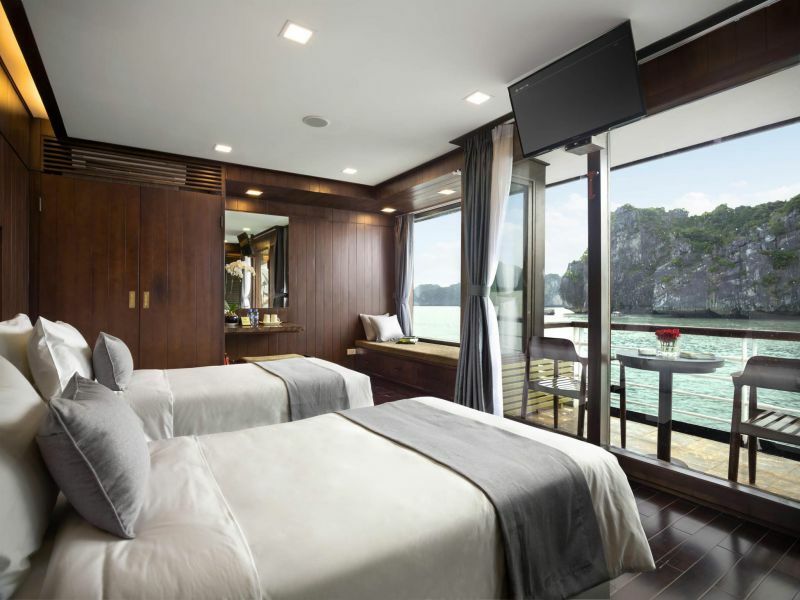 Following the international standard of design and decoration, the five-star cruise promises to bring you unique experiences through Halong Bay, Bai Tu Long Bay and Lan Ha Bay. Orchid Halong Cruise is the best Halong cruise which is outstanding the splendour and majesty of the heritage site of the world. 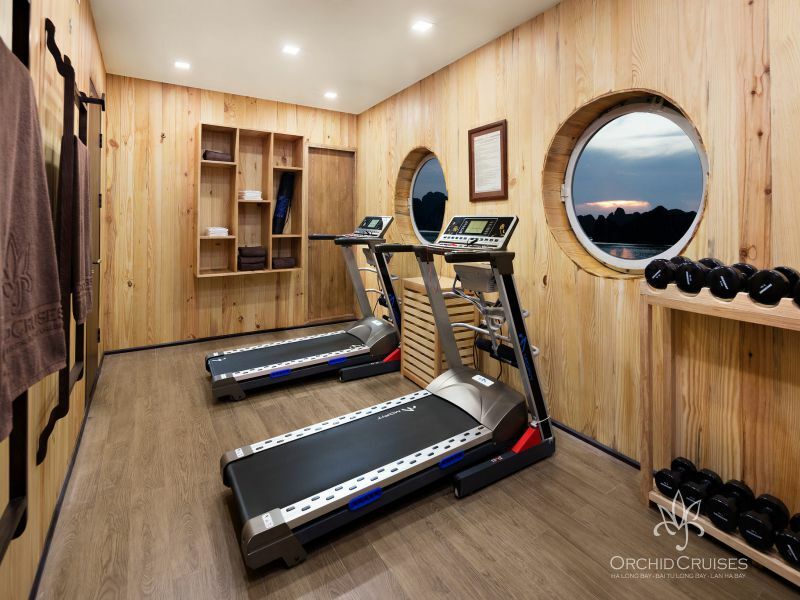 Orchid Halong Cruise Spa will make customised massages, facials and relax to you. 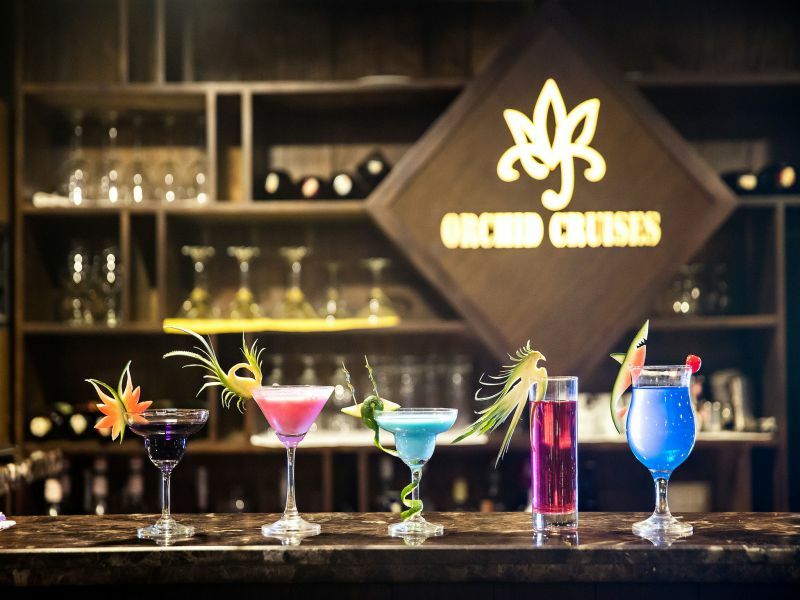 Enjoy various drinks and spirit served in luxury restaurant. 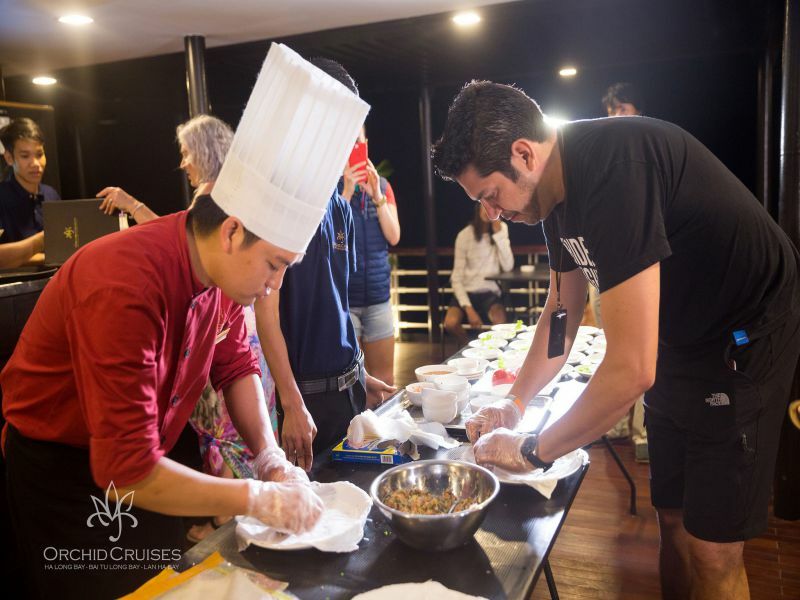 Cooking classes where you can try your cooking skill and learn about Vietnamese traditional food.